For large enterprises in today’s business world, internal communication might as well be synonymous with migraine. As companies expand, branches tend to become less and less connected as leaders struggle to communicate with thousands of employees spread out over different geographic locations. So what is the obvious solution? Give everyone an email address, right? While providing employees with a company inbox might seem like a quick fix to communication needs, it’s actually not the best answer. Contrary to popular business belief, here are 5 reasons why most employees don’t need email. When a workforce is small and employees are required to wear multiple hats, email can be the most effective way to communicate with vendors, clients and other external sources. In these specific circumstances, the cost of providing individual emails is usually an unfortunate but necessary business expense. 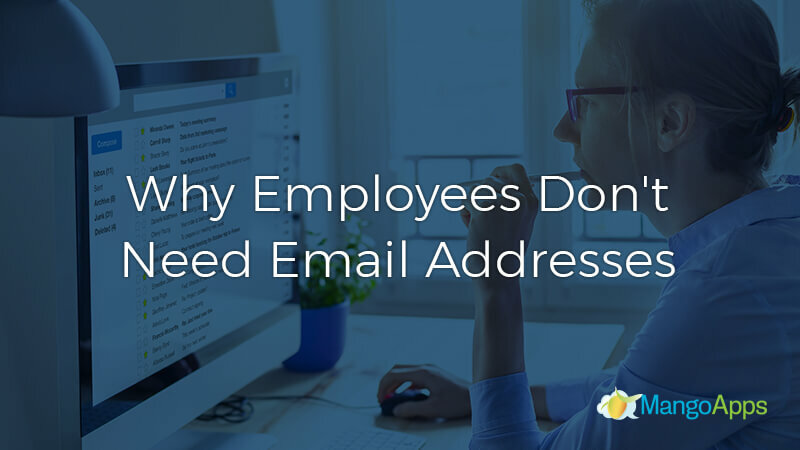 But in most companies, especially large enterprises, most employees don’t need email addresses. As companies grow and take on more employees, job roles tend to become much more specific and the need for external communication from the average employee greatly decreases. With corporate emails costing companies about $5 per user per month, it just doesn’t make sense to increase costs for decreased needs. Being selective about who does or does not need email saves money by cutting down expenses and reducing distracting overcommunication. Mental fatigue and the myth of multitasking are a real struggle in the modern working world, and being overwhelmed by endless email isn’t exactly helping. The ease of sending off a quick email (or two or three or four) has lead to employees spending hours every week just trying to sort, manage and understand everything being asked of them. And every new task, assignment, or to-do item sent off via email just becomes another top priority on the neverending list of things to get done. Employees don’t need email creating an abundance of tasks, with the potential to instantly receive even more. All endless priorities really mean is that there aren’t any clear priorities at all. When employees are focused on just one goal at a time, broken down into smaller tasks and to-do’s, they are happier, more focused, and more energized. Slowing down communication by taking away email makes assignments more directional, personal and effective. Emails live in a bit of an ambiguous world, pushing send doesn’t necessarily mean that the message actually arrived. And even if emails don’t get lost in cyberspace, there is still no guarantee that it has been read by the receiver. Emails also allow employees to skirt around news by not reading or claiming to have never received a message. Unless you receive some kind of acknowledgment, it is impossible to really know that your message has been read and understood. Straightforward communication methods like digital collaboration tools remove this ambiguity and create clear understanding and expectations. Digital collaboration tools, like MangoApps, eliminate the uncertainty of email by giving you the assurance that your message has been posted, making your message more visually appealing, making it easier to communicate with groups and by letting you know who has seen it and when it was seen. The working world is drastically changing, especially for big businesses. While some employees in large enterprises are probably traditional office workers who sit at a desk for the majority of the day, many are often away from a computer or don’t work around a computer at all. When they are traveling, working away from a traditional desktop, or just on the go, employees don’t need email and it quickly becomes an unaccommodating method of communication. Successfully searching email away from a desktop is difficult, and storing documents or communicating clearly with a group is even harder. Employees working in these environments, which grow larger and larger every year, need quick access to documents, content, and information. Removing unhelpful email and offering employees a device friendly digital collaboration tool makes work easier for everyone involved. Unfortunately, employee turnover is a part of business, especially at a large organization. Requiring an already busy IT department to create and cancel individual email accounts every time a termination or new hire occurs takes energy, time, and resources away from important work. Depending on your business email provider, regularly creating and deleting email users can cause additional charges and user fees as well. The average employee is already estimated to spend about 40% of his or her workday doing busy work, work tasks outside of the expected routine or work outside of the job description. Removing the burden of email management, especially for employees that rarely access or need it, will help IT employees spend more time being productive and accomplishing the important tasks at hand. Communication tools are essential to a business, but only when they are used successfully. 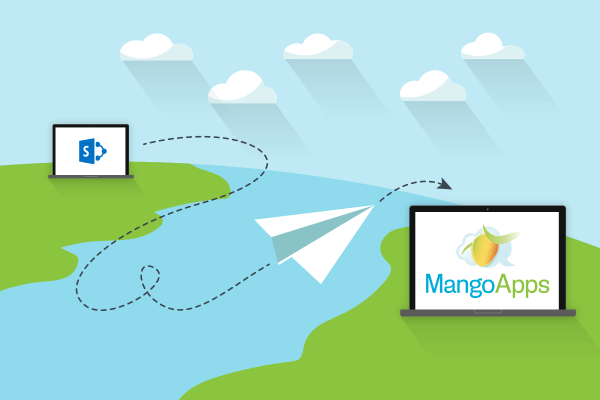 MangoApps helps all employees communicate and work together by excelling where email falls behind. We offer our clients flexible, customizable, easy to use, and affordable digital communication tools designed around the needs of both the everyday employee and the corporate executive. Mango Exchange is designed with the pitfalls of traditional Email in mind and lets employees send targeted and personalized messages to anyone in the organization, from any device, without the distractions or frustrations of an inbox cluttered with SPAM or irrelevant messages. Because all of the interactions happen internally, organizations can rest assured, knowing that employees are communicating safely and securely, while avoiding phishing or other malicious threats that come with email. Productivity is also boosted with built-in calendaring, notes, and to-do lists. Mango Exchange aims to widely replace email inboxes for internal-facing employees while improving the way that businesses and employees interact. To see why employees don’t need email, learn more about Mango Exchange, and contact us to schedule a demo today.